I am Tracy, a 29-year-old G2P1 lady at 37 weeks gestation. I am carrying a fetus identified to have hypoplastic left heart syndrome. This is the intro to the letter that Annie’s cardiologist wrote to the NICU staff for instructions about her care during and after delivery. He goes on to describe Annie: The exam of the fetal heart today demonstrated that the anatomy is consistent with hypoplastic left heart syndrome. There is aortic valve and mitral atresia. The left atrium is small. No significant restriction of flow across the atrial septum. Trivial tricuspid insufficiency. Ascending aorta measures 2 mm. No evidence of fetal heart failure. What in the world does any of that mean??? But the next paragraph is much clearer to those of us who don’t speak doctor lingo: The limitations of fetal echocardiography were discussed. 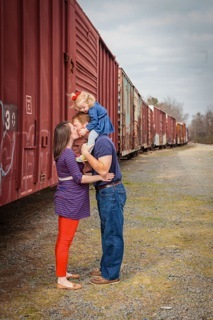 The family is aware that some forms of heart defect and disease may not be diagnosable until after birth. So we get it: to the best of their knowledge, they know what Annie has and how to treat it. But she’s not here yet. They haven’t yet seen her and examined her as a “neonate,” only as a “fetus.” So we think we know what we’re up against and how to classify Annie in a messy, erupting box of heart defects, but we really won’t know any of it until she gets here. All of those robotic, doctor descriptions plus all of the uncertainty about what the doctors could actually find is an unbearable burden that I will carry for the next days to weeks until she is born. But my friend reminded me that there’s more than one way to describe a person. (Since I’ve obviously never introduced myself as G2P1 before I knew she was right.) She asked if I would choose with her to concentrate on how God would describe our Annie in a letter He’d write to introduce her to the blue-gloved delivery room audience. I’m liking His introduction a little better! Have you ever said no to letting God work in a situation in your life? I have. It’s usually a situation that I think is too hard, too ugly, or too embarrassing to be redeemed, even in the Lord’s hands. It’s usually something that I think I could never share or say out loud if I ever wanted to be seen as a credible witness to the case of Christ. Or at least a reputable member of society. The reality is that this is me trying to clean myself up. It’s me trying to save face for ME. It’s me pretending like I don’t need this Savior I’m desperately trying to emanate. It’s me being embarrassed about areas that I’ve fallen so short…as if there were actually days and areas where I didn’t. This thinking is completely backwards to the way God works.Because what God asks of me is transparency to share what HE has done in my life. What He has redeemed. What ashes He has brought beauty to. What glory He has received in the valley. What He has transformed in the ugliness of my heart “to the praise of his glorious grace” (see Ephesians 1). I have fairly earned 8 speeding tickets, starting the first week I had my driver’s license. And those 8 times are a joke compared to the times I should’ve been caught. I cheated on a chemistry test in tenth grade by giving answers to a swoony senior boy sitting beside me, earning us both big, fat 0’s. I ran away twice during my junior year of high school. Yeah, there’s really nowhere to run away to when you’re 16, so that plan didn’t work out so well. But here’s a serious, big one. I’ve been embarrassed to admit that the financial burden for Annie’s medical bills is substantial, especially this year. It’s hard to admit because we both have college degrees; both have good, stable jobs; both work hard to provide for our family; and both are willing to make sacrifices to pay the bills that are coming (and will continue to come). I’ve kept telling myself that we can figure out some way to handle this. WE can do it…on our own accord. When will I learn? All I’ve really been doing is saying no to a way that God wants to show Himself in this hard, uncomfortable situation. A friend approached me and initiated setting up a go fund me account called the Heart for Annie Fund.I was so hesitant to say yes to this idea. How embarrassing to publicly declare that we cannot handle this situation on our own…again, as if there are any situations that we can handle on our own. Ugh! My pride and confidence in myself is disgusting! So I said yes and thought, We’ll see what happens. Well let me tell you what has happened. God has completely blown me away through the generosity of His people. I have cried my eyes out when every single time I refresh our page the amount donated has increased. When I see the names of people who have given to support our Annie, I cannot even begin to understand what God is doing. All I can say is Thank You!– to many of YOU who are choosing to make this burden lighter for us. Then I realized that by saying yes to a way that God wanted to work in me, I also said yes to a way that God might be working in others. Because of so many donations and so many posts about our family, God’s story of faithfulness through Annie’s life is being proclaimed in hundreds of places, even in other countries around the world. I pray that the next time I’m in a hard, uncomfortable situation I’ll say YES to however God wants to use it. Because He does want to use every single big or tiny situation in our lives to show His presence and proclaim His power. Oh, that I might strive to know Him more through whatever means He has instead of boasting in the superficial silliness of this life. I don’t like thinking about people living in poverty, suffering from illness, broken from crises, aching in their hearts. I like to ignore that those people exist. I pretend life is comfortable, easy, safe, and okay. Then there are those moments in life that can never be shaken. That forever mark a memory. The moments where you finally realize that there are real people out there who need real help. I think those moments are different for each person. For some, it might be going to a third world country and admitting that starving orphans have names and are more than simply pictures on a commercial. For some, it might be serving in a homeless shelter and finding commonalities with the toothless, bearded man you handed shoes to. For me, it was walking through the family housing and cardiovascular intensive care unit (CVICU) at Arkansas Children’s Hospital this past Monday. I never wanted to know about the 4th floor at Children’s hospital. To be honest, I still don’t. As we sat in the family room waiting for our tour guide, I saw other mothers’ faces. Faces that I’ve seen on Facebook pages. And I connected the pictures of their babies tangled in tubes to the exhaustion in their eyes. Then we strolled the halls of the CVICU. I saw more babies, more rooms, more families, more heartache, more need, more helplessness. And I know those tired eyes and aching hearts will be ours in a matter of weeks. But I know more than that now too. Now I’ve seen the faces of the heart babies waiting for a miracle. The faces of their parents asking why. The faces of despair. And now that I know, I have a responsibility. There were other faces I saw on Monday. The face of a pediatric heart surgeon. Compassion emanated from his eyes as he spoke confidently, knowledgeably, and respectfully about his plans for our Annie. I saw kind, smiling nurses loving and holding babies. I’m so thankful that this medical team hasn’t made the choices I have of naivete or denial toward the hurting. They’ve seen a great need and embraced it. But in all these people, the face of the heart I really saw that day was God’s. As I looked into each of their dark eyes, God asked me if I would be the one to share His hope. If I could be the one who doesn’t live in denial anymore. If I could be the one to connect with them, relate to them, and tell them He is still good. I know He can do that through me. Because He goes before us and has us on this journey for His purposes. The fetal heart echo revealed that her heart defect wasn’t really all that simple. “Rare, severe, and life-threatening” were all used to describe her condition that again should apparently prompt us to, “consider our medical options.” The pain waiting quietly on the banks surged through once more. That pain has now been dormant for the past 3 months, only whispering now and then to remind me that it’s still there. 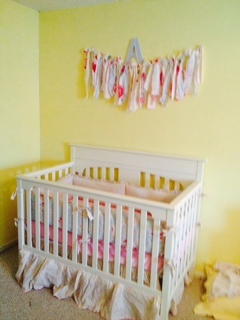 We set up Annie’s crib and took our maternity pictures. We’re anticipating a baby shower for her next weekend. We’ve been moving forward, ignoring those haunting what-ifs. Now at 34 weeks, knowing that Annie’s arrival is just around the corner, they’re screaming too loudly to drown out anymore. I lay in bed at night physically sick from the dull ache in my chest. Over the past week, I’ve lost the mental battle and let myself wallow in fear and worry. I’ve read way too many stories of families losing their babies, looked at an embarrassing number of pictures of babies after their Norwood procedure, and even searched HLHS on Pinterest. Really, friends, this is getting bad. And then our Ash Wednesday service signified the start of the season of Lent. A season to give something up for the Lord, something that’d be a sacrifice. So in the 41 days until Annie’s due date, I’m giving up my time in and my rights to my thoughts. Instead of losing myself in the chaos of my mind and trying to fight this rampant spiritual battleground in my own strength, I’m putting on the armor of God. I’m saturating myself in the Scripture instead of in all those inspiring, but addicting, “Prayers for such and such heart baby” Facebook pages, Instagram posts by adults living with HLHS, and Pinterest videos where cardiologists at every children’s hospital in the US explain their variation of the 3-stage surgery. ECK! I am putting my mind on things above, focusing on God and His sovereignty, His love that has me in this storm so that He can continue my redemption by it, and His presence. He isn’t asking me to walk here alone, and He sure isn’t asking me to walk where I’m about to go without Him either. He says, “Take heart; it is I. Do not be afraid” (Mark 6:49). The I AM is with me and He can do this! 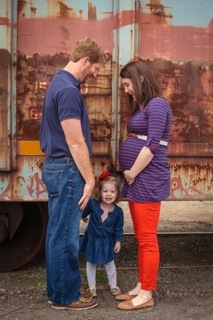 And a couple of family maternity pictures by our talented friend Jeanne Butler!